Do you have a built in water filter to your fridge/freezer? I posted on this a few months ago. In the long run, if you have one, it is cheaper to replace the filter when indicated vs. purchasing filtered or bottle water for your home. Most filters last several months. Don't limit yourself to just using it for drinking water and ice at home. Use your filtered water for cooking, tea, coffee, filling bottles to take as you head out the door and more! Filtered water isn't necessary for doing dishes but for any other time that water is needed the filtered water is best. It is comforting, as a parent, to know that the filter is working to easily free the local water of impurities. Have you ever tested your water at home? Try it sometime. Do it with and without the filter and see for yourself the difference in the water. Now, only if the Whirlpool Water Filter gives us sometimes. 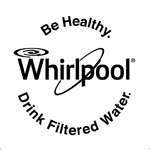 I wrote this review while participating in a campaign by Mom Central Consulting on behalf of Whirlpool and received product samples and a promotional item to thank me for taking the time to participate.My own tasty words & opinions are expressed here.